GALION — In 2017, the Galion Lady Tigers tennis team had a banner year. Make that a championship banner. At the end of the regular season, Galion finished with an undefeated record of 22-0 overall, which included a perfect 12-0 in the Mid-Ohio Athletic Conference. In addition to winning the Bucyrus Invitational early on in the season, the Lady Tigers also brought home the MOAC tournament title, claiming the league championship over the runner-up Harding Prexies 26-23. Fast forward to this fall, and the same ladies that brought home the league hardware a season ago will all be back in the blue and orange for head coach Bob Roesch, who is entering his ninth season as head coach. He will, once again, be joined by assistant coaches Terry Gribble and Tom Pawsey. Headlining the entire returning roster for Galion are a trio of singles players. Kayley Gimbel was named to the MOAC first-team squad last season and finished as the MOAC Player of the Year. Gimbel finished her junior season with a 23-3 record and made it all the way to the state championships. Other heavy hitters joining Gimbel on the singles roster are Katherine Talbott and Jalyn Oswald. Talbott and Oswald both finished their regular seasons at a perfect 25-0 and received second-team, all-conference nods in the process. Katie Baughn and Elli Chandler will be back at second doubles where they finished 2017 at 21-3, good for a second-team nod. The first doubles pairing saw a few different faces in 2017 and finished with a final regular season mark of 11-9. Also returning for the Lady Tigers this season will be Kiersten Gifford, Marissa Breinich, Orchid Parsons and Danielle Schneider. Gifford will be vying for her fourth letter, alongside Breinich. Parsons and Schneider are trying to earn letter No. 3. Galion will officially kick-off competition on Saturday, Aug.. 11, when they take part in the Ontario Invitational. On Tuesday, August 14, the Lady Tigers will head to Marion to begin MOAC play against the hosting Pleasant Lady Spartans. After a long road trip to start the season, the Galion squad will finally test out the new courts in Heise Park when they play host to the Ontario Lady Warriors on Thursday, August 30. 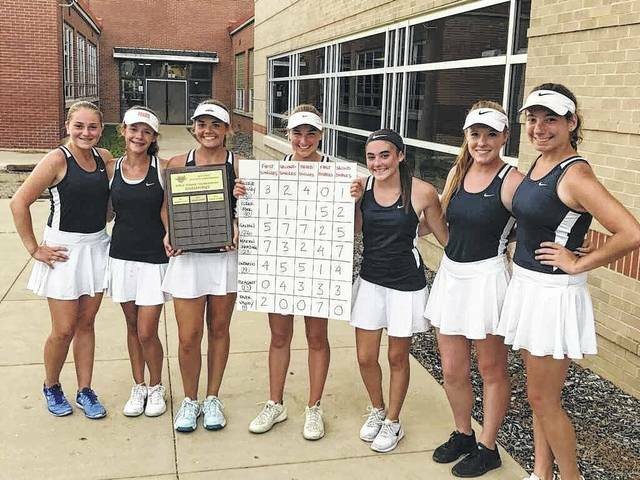 Archive photo The Galion Lady Tigers tennis team, pictured here after clinching last season’s Mid-Ohio Athletic Conference tournament championship, will be returning their entire roster from their undefeated squad in 2017.
https://www.galioninquirer.com/wp-content/uploads/sites/38/2018/08/web1_MOAC-Champs.jpgArchive photo The Galion Lady Tigers tennis team, pictured here after clinching last season’s Mid-Ohio Athletic Conference tournament championship, will be returning their entire roster from their undefeated squad in 2017.